This large political world map is what we call the "Huge Blue Ocean World Map." It features brightly colored land masses, light terrain shading, and bold, easy-to-read lettering against a light blue-colored ocean. 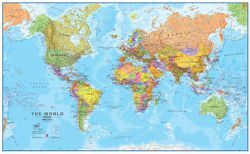 We recommend this world map for kids because it is so easy to read, up to date and detailed. But adults love it too!